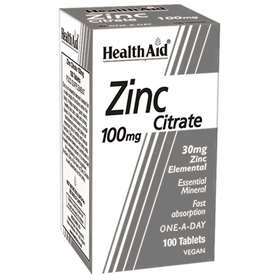 Health Aid Zinc Citrate contains zinc which is needed by the body for many functions. Zinc helps stimulate several enzymes and is therefore involved in normal cell growth. It also helps sexual maturation, healthy organs, immunity, digestion and general health. HealthAid provides Zinc Citrate tablets that are easily absorbed and digested by the body for maximum effect. Free from yeast, gluten, wheat, soya, dairy, sugar, salt, artificial colourings, preservatives and flavourings. Suitable for adults. Take one tablet daily with a meal. Do not exceed recommended daily intake unless advised by a suitably qualified person. Long term intake of this level of zinc may to anaemia. If you are pregnant, breastfeeding, or on prescribed medication, consult a healthcare professional before taking this product. Zinc Citrate (100mg per tablet). Which provides Zinc (30mg per tablet). Other ingredients: Bulking Agent (di-calcium phosphate, microcrystalline cellulose), Zinc Citrate Dihydrate, Disintegrant (croscarmellose sodium), Anti-caking Agent (veg. stearic acid, veg. magnesium stearate, silicon dioxide), Coating (hypromellose, polydextrose, talc, maltodextrin, medium chain triglycerides).